2016 Chevrolet Malibu Pros and Cons: Why (Not) This Car? Chevrolet used to own the midsize sedan market. Then, beginning in the mid-1980s, a combination of missteps by a disorganized GM and more desirable sedans from Ford, Honda, and Toyota destroyed Chevrolet's dominance. Four generations of the Chevrolet Malibu, introduced for the 1997, 2004, 2008, and 2013 model years, were intended to reconquest Chevrolet's lost market share. All four fell well short of the goal. The 2013 Malibu received an especially brutal reception due to a weak, insufficiently efficient mild hybrid engine (the only one offered initially), flaccid suspension, and tight rear seat. With alarm bells sounding, GM made what tweaks it could for 2014 and rushed a fully redesigned replacement to market for 2016. Chevrolet likely studied the Toyota Camry while developing the new Malibu. But the Camry's position atop the sales charts owes much to its reputation for reliability. Though the Camry does most things well, it doesn't stand out in any area, and virtually no one thinks it's the best volume-brand midsize sedan if reliability is taken out of the equation. A stronger case can be made that the also-new-for-2016 Kia Optima is the car to beat. No car company learns faster or tries harder than Kia. Car buyers have responded positively. Combined sales figures for the Optima and the closely related Hyundai Sonata place them second only to the Camry. I drove the new Optima the week before I tested the Malibu. Both cars were at the top of their respective ranges, and both were powered by turbocharged 2.0-liter engines, an even match. Has GM's come-from-behind effort managed to top even the hard-charging Koreans, or is Chevrolet's fifth attempt not the charm? A lot going on in here. Note stitched and padded trim on the dash face and the sides of the console. Why the 2016 Chevrolet Malibu? The Chevrolet Malibu continues to excel in one area, quietness. To my ears it's the quietest car in the class, though the Ford Fusion isn't far behind. Inside the new Kia Optima wind noise is low, but road noise isn't suppressed as well. The Mazda6, a car reviewer favorite, seems considerably louder than the others inside despite recent efforts to make it quieter. The new Chevrolet Malibu also has a smoother ride than competing sedans, though the ride of the car I spent the most time in, a top-of-the-line Premier, at times felt a little bumpy. The blame rests with the Premier's low profile 245/40WR19 ContiProContact tires. A Malibu LT shod with 225/55HR17 Goodyear Assurance tires better absorbed small bumps. The Kia Optima SX, with a more aggressively tuned suspension, has a more jittery ride than either Malibu, but also a more tightly controlled one. The relatively soft Malibu lapses into some bounce-and-float over uneven pavement, but far less than the first 2013 I tested. Most controls are well designed. But the manual gear selector is in the same awful place as before. Chevrolet's designers styled the new Malibu's instrument panel to appear low and out of the way, such that the front seat feels especially roomy and the view forward seems more open than in most competitors, including the Kia (the instrument panel in which seems significantly higher and more imposing). In the tested car, which had every option except the panoramic sunroof, headroom was so abundant I could have worn a fedora. The Kia Optima might have as much front headroom when similarly without a sunroof. The official specs, which often don't reflect real world differences, suggest it should have even more than the Malibu. But you cannot get a highly equipped Optima without the sunroof, as it's part of a large package on the SX and standard on the SX Limited. Though the Malibu's windshield is relatively large, you won't find outward visibility among the reasons to buy one. The Chevrolet's front pillars remain on the thick side, its instrument panel is considerably deeper than the Kia's, and the view to the sides and rear also could be more open. In the Optima, the view to the sides is more open but that to the rear is not. I did find the Cherolet's front seats more form-fitting and comfortable than the Optima's. The Kia's quilted seats aren't as cushy as they appear. When I reviewed the 2013 Chevrolet Malibu, its list price was about even with the Ford Fusion's but was undercut by the Hyundai Sonata's (nearly $2,000 less before adjusting for feature differences, about $700 less afterwards). In the three years since, GM has resisted raising prices much better than competitors have. A loaded-up 2016 Malibu lists for about the same as a 2013 did, while including about $1,500 in additional content.. A fully loaded new Malibu (the tested car plus a panoramic sunroof, for a bottom line of $35,555) undercuts a similarly equipped Ford Fusion, Chrysler 200, or Volkswagen Passat by over $2,000. A Honda Accord Touring is priced about the same as the Malibu Premier, but the Chevrolet has about $1,200 in additional content. A loaded Camry XLE lists for $780 less, but the Chevrolet includes about $2,700 in features that you cannot get on the Toyota (things like a panoramic sunroof, cooled front seats, a heated steering wheel, an AC power outlet, automatic-braking, lane departure prevention, and obstacle detection). The story is similar with the Nissan Altima. The toughtest price competition once again comes from the Koreans, except this time around the Hyundai Sonata and Kia Optima are priced about even with the Malibu while having a similar level of content. Why Not the 2016 Chevrolet Malibu? The new Chevrolet Malibu handles very safely and competently, but without even a hint of sportiness. Its steering and suspension do little to engage the driver. The 2013 Malibu with the 2.0-liter turbo engine was also no sport sedan, but I somehow connected with it better than I did the 2016, which kept me at a distance. A less thickly padded steering wheel rim would be a step in the right direction. Though no car in this class is all that exciting to drive, the Kia Optima in SX trim is considerably more engaging than the Malibu, as is the most agile sedan of the bunch, the Mazda6. By all rights the Malibu should feel the most agile, General Motors did a fantastic job paring about 250 pounds from the sedan even as they made it larger, taking it from one of the heaviest in the class to the lightest. But tuning eliminates this potential advantage. Historically GM has tuned cars to feel larger and heavier than they actually are. Perhaps more car buyers want this than agile handling. You can get nearly all of the features available on competitors on the Malibu. But you cannot get all-wheel-drive (offered on the Ford Fusion, Chrysler 200, and Subaru Legacy) or a sport model (offered by most competitors). Don't want AWD or a sport model? Then ignore this "why not to buy." With this, I'm out of even somewhat strong cons. Chevrolet keeps trying to make its horizontally split grille work. Getting better? The back seat is now competitive, but still not among the best. The 2016 Malibu's exterior is much sleeker than the allegedly Camaro-influenced, square-shouldered 2013. It's a pretty car, yet in a way that lacks personality. The basic shape is too much like those of the Ford Fusion and Chrysler 200, and it's so slender and clean, that there's little beyond this basic shape. Some muscle in the fenders, like those of the current Chevrolet Impala large sedan, would render the new Malibu more distinctive and less invisible. A combination of the two sedans' best elements could be stunning. Or maybe this is missing the point, that point being to have the car's minimalist lines flow cleanly, tightly, and without interruption from nose to tail? At times I'd find an interesting angle, or admire the purity of the thing. Then I look at the Malibu again and only see a shape like too many others. Though toned down from the less refined 2011-2015 Optima, the 2016 retains its predecessor's distinctive chrome roof line strip and intriguingly kinked rearmost side window. With a bolder face and more flare to its fenders, the new Optima has more road presence than the new Malibu. The "turbo" fender badges and red brake calipers are in questionable taste (these aren't high-performance fixed-caliper brakes, no point in drawing attention to them), but overall the Optima appears sportier than the Malibu and arguably more upscale as well. Judgments of styling are of course subjective, and your impressions may differ from mine. You might much prefer the Malibu's styling to the Optima's. The new Malibu's interior is more distinctive than its exterior. Chevrolet's designers really tried to do something here, and I appreciate this. Some people might find the upholstered instrument panel fascia odd, especially in the cloth interior, but I like the visual interest it adds. In black, the interior works better. With a single tone the interior seems less busy. And in black the hard plastics on the doors and the top of the instrument panel are also less obviously hard plastic. The Optima's interior is less distinctive, at least if you consider the interiors in premium European sedans that Kia's designers borrowed from. But they stole well, and the Kia's interior does seem sportier and more upscale than the Malibu's. It would look even better if the instrument panel and upper door panels were less obviously moldings with stitching embedded in them. Such stitching is all the rage lately. Quite a few executions are worse than the Optima's, but some are better. The Malibu's interior also includes plentiful decorative stitching, but all of it stitches actual material, not molded parts. A tight rear seat doomed the 2013-2015 Malibu as much as anything else. 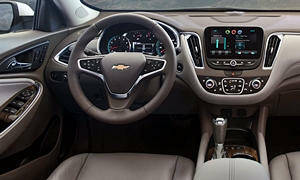 Chevrolet had cut the model's wheelbase by four inches compared to the 2008-2012 Malibu, and this hurt. This lesson learned, the 2016 regains 3.4 of those lost inches. According to the official specs its rear seat room is now competitive. In reality, the new Malibu's rear seat still seems tighter than some others, including the new Kia Optima's. It feels somewhat narrower at hip level than some others, and the angles of the seat cushion and of the floor conspire to keep me from finding a comfortable position for my legs and feet. The Kia Optima's rear seat seems roomier and more comfortable. This said, my head doesn't come nearly as close to the headliner in the Malibu's back seat, so people 5-11 and up will prefer it to the Optima's. Fitted with a 250-horsepower turbocharged 2.0-liter four-cylinder engine (much like that similarly optional in the 2013-2015) and a new eight-speed automatic transmission, and carrying fewer pounds, the Chevrolet Malibu is quicker than four-cylinder competitors, including the Kia Optima. But it's not as quick as the V6s from Honda, Toyota, Nissan, Chrysler, and Volkswagen. The V6s also sound and feel more exciting. Though not as quick at full throttle--the Malibu can get to 60 mph nearly a second sooner--the Kia can feel more responsive, especially in its sport mode. The Malibu lacks a sport mode. And while the Kia has shift paddles, the 2016 Malibu only has a "range selector" in the same awful location as in the 2013, on top of the shifter. To use it, you've got to hold your hand a couple inches over the shifter and press downwards with one finger. This feels odd, and isn't remotely part of a properly sporty driving experience. This being a range selector rather than a direct request for a specific gear, the transmission then decides what it wants to do. The upshot: that button will rarely be used. Left to its own devices, the eight-speed automatic can resist downshifting to the point of lugging the engine. To the engine's credit, boost comes on so smoothly and naturally that it's not obviously a turbo. A new 163-horsepower turbocharged 1.5-liter engine, though smooth for a four-cylinder and delivering adequate performance, must work harder in typical around-town driving than the 2.0-liter. In a mad dash to 60 mph, the larger engine will win by a wide margin, getting there in the mid sixes rather than the high eights. Not that mad dashes are in the spirit of the car. While driving cars with the two engines back-to-back it became clear to me that the point of the larger engine isn't thrilling acceleration, but more effortless acceleration. With just a little more tweaking and a better way to interact with the transmission the Malibu Premier's powertrain could be a reason to buy the car. As is, from a driving enthusiast's perspective I prefer the engine and transmission in the less potent Kia. When fitted with the turbocharged 2.0-liter engine, the 2016 Malibu scores a little better in the EPA's fuel economy tests than the 2013-2015's with the same engine but two fewer transmission ratios did, 22 mpg city, 33 mpg highway vs. 21 and 30. This improvement places it about even with the performance-oriented engines in competitors. For example, the Kia Optima SX scores 22/32. In my real-world suburban driving, the trip computer reported averages as high as 29.5. When I used much of the engine's potential averages close to the EPA city rating happened. On a 70-mph highway the trip computer reported an average of 32.8, very close to the EPA rating. For the week overall I averaged 23.6 mpg, good for a car of the Malibu Premier's size, power, and quietness. I oberved similar real world fuel economy in the Kia Optima SX, with a suburban best of 30.1. Of course, buyers who care greatly about fuel economy will opt for a less powerful engine. The new turbocharged 1.5-liter engine, though still paired with the old six-speed automatic, achieves 27/37. The non-turbo 2.5-liter engine it replaces underwhelmed with 22/34 for 2013 but managed 25/36 after tweaks made for 2014. The real fuel economy star will be the upcoming Malibu Hybrid. Employing a powertrain based on that in the Volt, but with a stronger engine and much smaller battery pack (you can't plug it in), the hybrid has scored 47 mpg city, 46 mpg highway. It will cost $2,750 more than a Malibu with the 1.5T engine and $1,240 more than one with the 2.0T engine (when similarly equipped). The new Chevrolet Malibu doesn't excite with its styling or with how it handles a curvy road. Buyers seeking visual and dynamic excitement are more likely to find it in the Kia Optima SX or the Mazda6 (if perhaps still not to the degree desired). 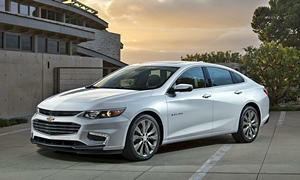 With the new Malibu, Chevrolet was clearly gunning for the Camry. Not the current Camry, but the one a few generations back that surprised the industry with its smoothness, quietness, and all-around refinement. They've nailed that target. The 2.0-liter engine doesn't make the Malibu into a sportier sedan, but into a more relaxed one, as the larger engine has to strain less in typical daily driving than the standard 1.5-liter. Plus Chevrolet has priced the new Malibu fairly aggressively. Have they also achieved Camry-like reliability? Only time will tell. If they have, the new Malibu will prove an excellent choice for people seeking a thoroughly competitive midsize sedan that, while not exciting the senses, does the opposite very well. The forte of the turbocharged 2.0-liter engine is effortless acceleration. Trunk about average for the class. But no grab handle on the inside of the lid. Chevrolet and Kia each provided an insured car for a week with a tank of gas. April Iuga of Feldman Chevrolet in Novi, MI, helpfully provided a second Malibu with the 1.5T engine. She can be reached at 248-912-9163. 2016 Chevrolet Malibu pros and cons, according to Michael Karesh: the best reasons for buying (or not buying) the 2016 Chevrolet Malibu. Join TrueDelta to post your own impressions. Nice review. This sentence needs a tweak "Then I'm look at the Malibu again and only see a shape like too many others." Fixed, thanks. It's also possible to report typos through the contact form (link in the footer). I've seen a few Malibu's around the Baltimore area and I agree that there is something lacking about the design. I do like the way it looks, but it does just seem like it's trying hard to be a Fusion or 200 that it can look akward from certain angles. Also I want to add that I love how you compare models prices with it's feature content. This really helps get the picture of true pricing. This Malibu reflects what I'd classify as GM's best mid-sized sedan effort to date. I know that sounds like damnation with faint praise, but I think it's appropriate. Emotionally I just can't force myself to warm up to anything sporting a Chevy badge and yet I must acknowledge they've made great strides. I wouldn't feel that parking this Malibu in my driveway would cause my neighbors to think less of me. It's important to note that Chevrolet's advised fuel requirements for this 2.0l Turbo engine are, "premium recommended but not required", yet all of their figures for horsepower,torque, and fuel economy are utilizing premium fuel. Factoring premium fuel costs into the equation is a huge competitive hit that shouldn't be overlooked. I'd have to disagree that the Optima represents the best mid-sized sedan offering. The Kia provides similar flaccid driving dynamics as the Toyota, but with lots more standard equipment and expansive warranty coverage, but I think when you consider the five year cost of ownership and the depreciation experience, the Toyota is ultimately a smarter choice. Or you could follow your heart with the Mazda 6; the only emotionally engaging ride in the mid-sized pack. Only big negative for the Mazda in my eyes is the weak warranty and customer service support that you don't really appreciate until you need it. I haven't driven the regular Kia Optima. The Optima SX's handling didn't seem flaccid to me, though. In terms of driving dynamics in this segment, Mazda 6 is the clear #1, Honda Accord is #2, the Kia is well down the list although the 2016 SX with IRS and 18" wheels and wider tires is the best of the Optima offerings. BTW; the Honda 3.5l V6 offers better real world fuel economy and HP than the turbo'd Kia. The resonant standout statistic in this segment for the Kia is it's depreciation performance. Honda's V6 is an excellent engine. Thanks for th very interesting and timely review. I am considering the purchase of a Mazda6, Kia Optima or a Mailbu it got my full attention. I'd recently test-driven the Malibu 2.0 turbo, sans sun roof, as well as the base Optima EX and the SX Launch edition. I am surprised to say that I found the Optima EX to be the more satisying experience of the three test drives. I think the EX also delivers the most bang for the buck, if one can live without a turbo. Michael, I also completely agree with your observations about the Malibu's 8 speed transmission, which I did not find particularly inspiring. The Malibu's interior also left me lukearm and I did not care at all for the fabric insets on the dash but do agree that in a black interior they are a bit more acceptable than in a lighter interior (kind of like other things 'in the dark', wink-wink). What I did really like in the Malibu was the infotainment set-up, which I found more intersting and engaging than Kia's system. It was in some ways more like the set-uo my wife's 2015 Outback, which I think is a stellar system. While I don't think the Malibu will make my final cut, I do want to test drive the Malibu hybrid, which could change my mind, though unlikey. I'd also test driven several Mazda 6's in the past 6 months and while it looks and handles great, the Optima feeels considerably more roomy with many more creature comforts and safety features that come standard but are options, if available at all, on the Mazdda. Kia right now tops my list so I look forward to your 2016 Kia Optima review. Great review and comparison :) I disagree only with the exterior styling which I find way better than the Optima, but that's one of the purely subjective things. I guess to me the biggest disappointment here is, we have a car with significant weight reduction, an 8 speed transmission and no excitement as an outcome for its top of the line offering. Opportunity lost. Its so sad that fuel economy "drives" everything. In the good old days, if an 8 speed transmission came along, everyone would be salivating about how this created a close ratio gearbox, and much more speed and excitement. In this segment I'm waiting for the Fusion Sport reviews. I do feel that the Malibu is the more skillfully and tastefully styled car, but something's just missing for me. I'm looking forward to reviewing the Fusion, but don't know how soon this will happen. Currently Ford's press fleet people aren't returning my emails. Could it have been something I said? The reliability scores for some Fords on the site? I'm not good at mind-reading, and have no idea. I might just have to drive one at a dealer. Now that Accord has it's suite of turbo -4's and multiple gear ratios transmission leaving new Camry with the same old engines, it might be time to see how this redesign from 3-years ago compares to the new Accord. I would hope it would blow the Malibu 's doors off but Motor Trend and Car & Driver performance tests say the new Accord improves but in only on the same level as the Malibu. MT has the 2017 Malibu better than the Accord V6 in handling figure eight test, shorter braking to a stop from 60 mph and much better highway fuel economy. The dealerships are advertising a similar Malibu 2.0T for around $26'000 wutg allot of discounting making any psuedo Honda resale value moot.Now that some tests have been done on the new Accord 2.0T it is finally beating the V6 by a hair and finally catching the older Malibu. Not sure why Honda didn't set the bar higher as we know Acura is not even not even competitve. Looks like the new Accord just has a pretty face on it, it to say the outgoing .model wasn't.